Mt. 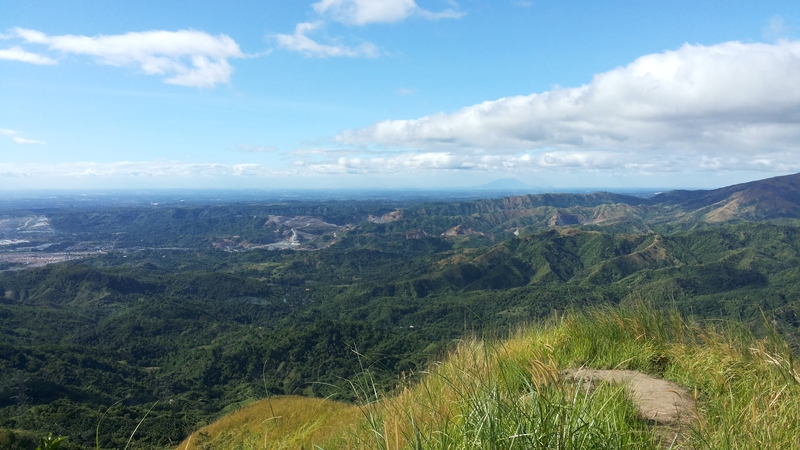 Ayaas, standing ∼627 masl, is the highest among the 5 mountains open to hikers in Brgy. Mascap and Brgy. San Rafael areas. I thought that Mt. Ayaas also had stone formations just like Mt. Pamitinan, Mt. Binacayan, Mt. Sipit Ulang, and Mt. Hapunang Banoi making it more difficult because we had to negotiate climbing and descending through rough-textured rocks longer. But I was wrong. Coming from Mt. 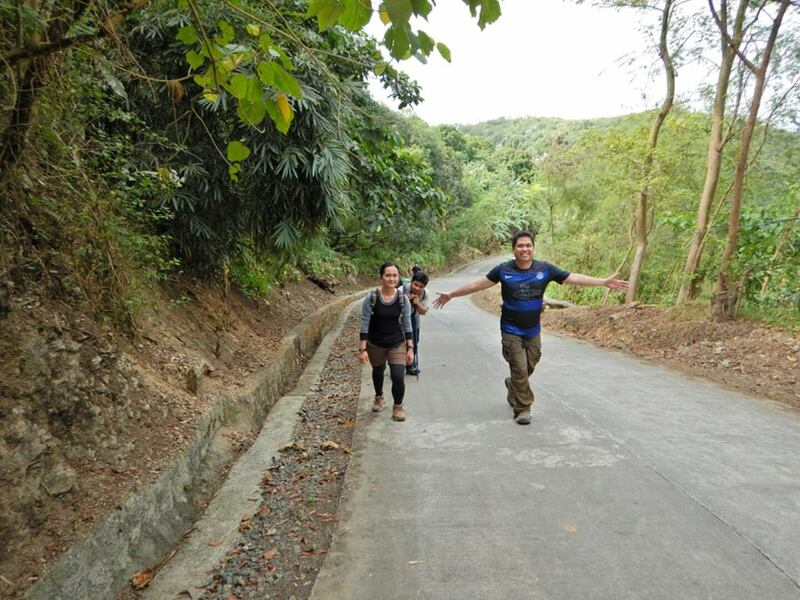 Sipit Ulang traverse, we walked along a cemented road going to Mt. Ayaas jumpoff. I don’t like walking on cemented roads especially if its uphill. It’s painful to the feet. Mt. Sipit Ulang hike was unplanned, so we still had not eaten lunch at 12 noon. Instead, we energized ourselves with sandwhich crackers and soda drinks. 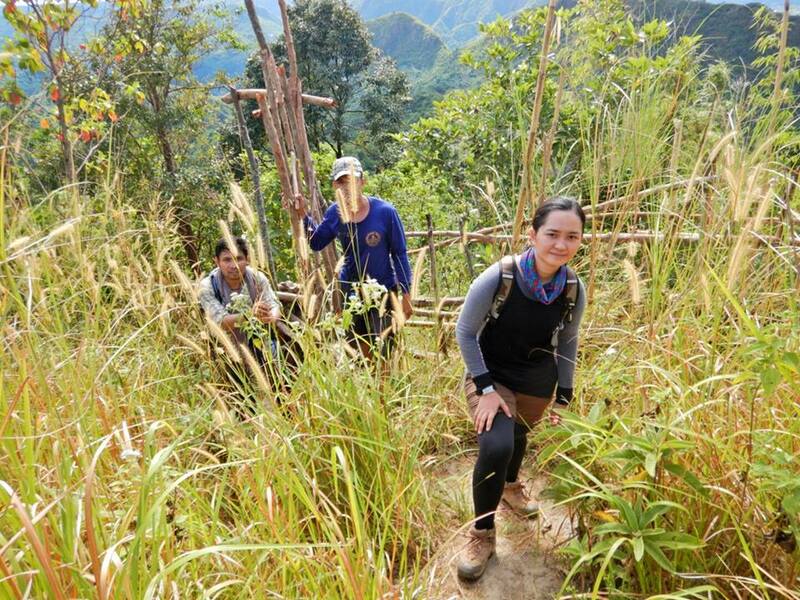 We started trekking Mt. Ayaas trail at 12:15 p.m. There were clouds in the sky partly covering the sun, but it was still hot. We no longer minded the discomfort and just kept on walking. We felt the need to rehydrate more often along the trail than earlier in the day. There was a broken pipe along the trail. The open portion was just covered with a piece of bamboo. We refilled water from it. I just thought it was unsafe especially for people who will be using the water below. The trail to Mt. Ayaas was pretty straight forward. All we had to do was to walk, uphill 95% most of the time, along the soft ground. I have not observed stone formations along the way, just vegetation. I would know if the peak is near when talahib or flags (tall weeds with sharp edges) are present. There was fence that we had to cross. Several posts were placed reminding hikers that it was not allowed to hike Mt. Ayaas without registering first at Brgy. Mascap. After 2 hours and 15 minutes, we finally reached the peak of Mt. Ayaas. There was a purple flag and an abandoned hut on top. There was barely a flat surface. For me, the views in the four other mountains mentioned above were more attractive. View in Mt. 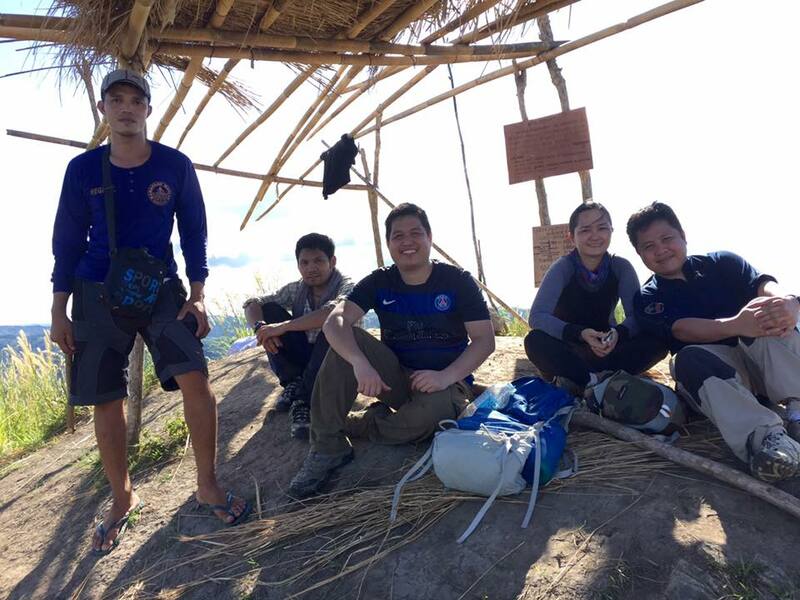 Ayaas was just 360º allowing view of mountain ranges that the guides did not identify if they were part of Sierra Madre mountain range or not, buildings of Makati, nearby villages, and even Mt Arayat located in the province of Pampanga. Mt. Arayat that has this shape: /¯\, is the one in faint shadow under the thicker clouds in the picture below. Did you find it? 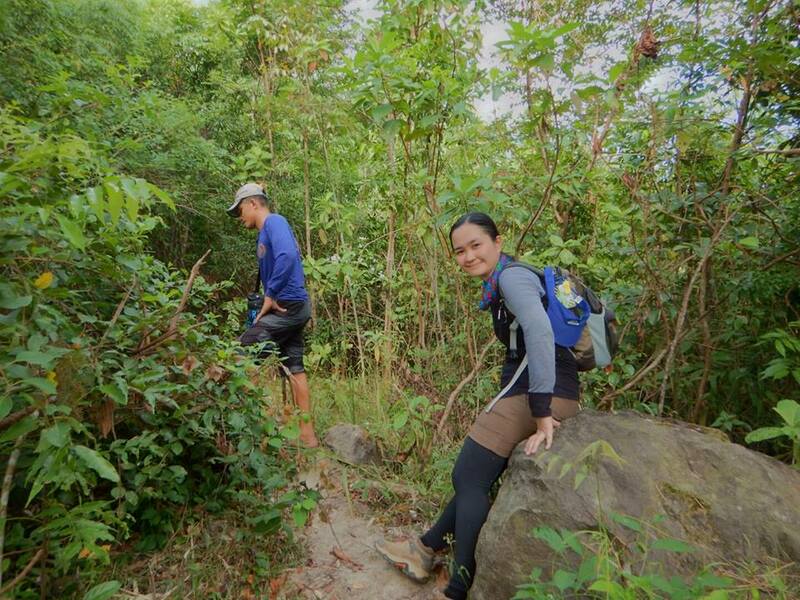 We started to descend at 3 p.m., taking the trail going to Sitio Wawa, Brgy. San Rafael. We followed the stream and reached Wawa Dam at 6 p.m., completing the longest trek in a day I had done so far (including Mt. Sipit Ulang in the morning), which was around 21 Km as per iPhone 6 application tracking system. maganda rin. pero mas maganda sa ibang karatig bundok nito. Tama tama. Mapuno sa Rizal no? Napansin ko lang. Oo nga e. Walang hindi matulis na bato. Pag nagkamali ka, engk!! Can you recommend this to a first time hiker like me? Hi Jan, if you are used to longs walks or if you jog regularly, Mt. Ayaas will be fairly easy for your first hike. You may do Mt. Sipit Ulang traverse as well, on the same day. Mt. Sipit Ulang is more technical thn Mt. Ayaas. Be extra careful then. Listen to your guide and seek assistance when you are not sure which rock surface to hold or set foot to. Don’t forget to bring a pair of gloves (garden gloves will do). Papano Pumunta jan sa Mt. Ayaas kung manggagaling ako ng Marikina? Hello Sir. Hindi po ako familiar sa Marikina Area so I have no idea kung may van or jeep din na bumabyahe papuntang Eastwood, Rodriguez sa may sakayan ng tricycle papuntang Mascap jump off to Mt. Sipit Ulang and Mt. Ayaas. Sa van sa labas ng Jollibee Farmers Plaza in Cubao po kmi sumakay. Thank you for stopping by my blog. See you in the trails. ok thank’s, atleast i have now an idea. Hi! Meron ba kayo contact no. ng tour guide sa Mt. Ayaas? May overnight ba dun? Hi Lotsky, I already got the new number of Kuya Abner and he agreed for it to be posted here: 09103885692. Happy hiking!